After introducing the project, the first partners, and the end vision I’ve decided to close out roughly a half-year of updates with a significant step forward in the long journey towards getting Project Why Wait road worthy. 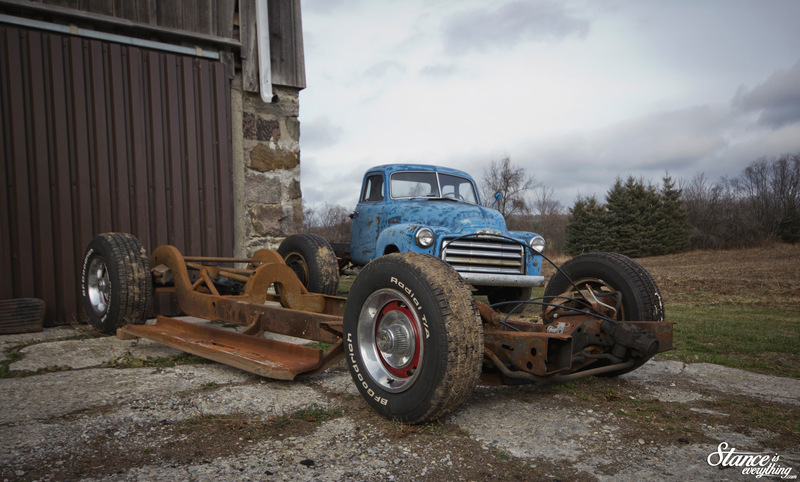 Those subscribed to Performance Improvement‘s Performance In Motion magazine are already privy to this news, but to those of you that are not, I recently purchased a chassis built by Dave Newberry and Hitman Hot Rods fabricator Jeff Wybrow, previously intended for use under Jeff’s “Rot-box Turned Tire Roaster”. 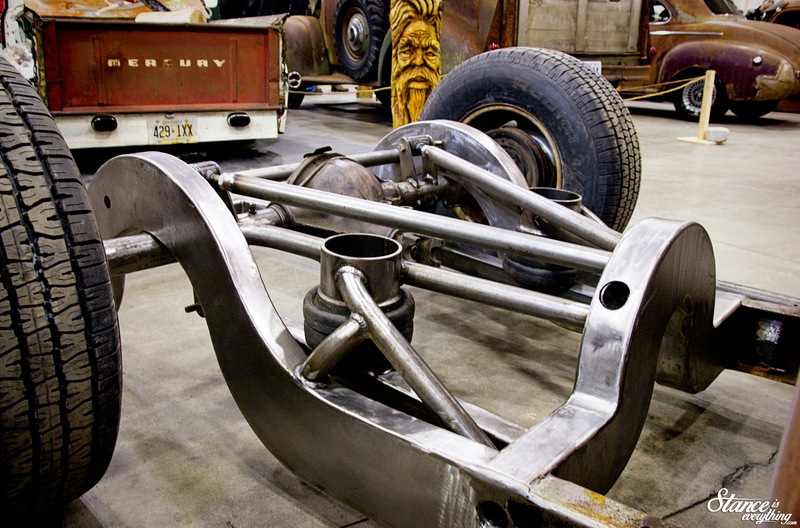 The chassis in question is actually no stranger to the site and was heavily photographed after its initial debut at the 2014 Megaspeed car show. It’s a great chassis to start with for several reasons, but before I get too far down the road of describing its ins and outs lets rewind to how I ended up with it. When it comes to putting a ’47-54 Chevy/GMC truck on the ground one of the more popular options is to put the cab and box on top of a long box s-10. 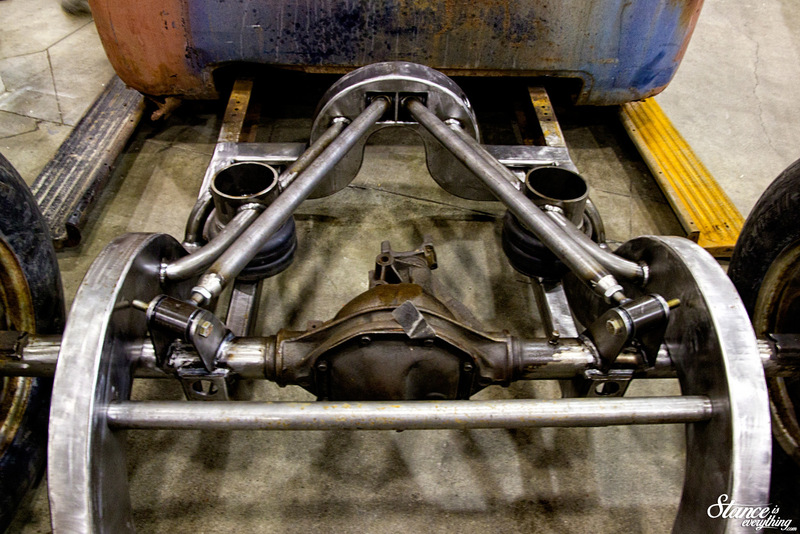 This instantly opens up the doors to the extensive aftermarket options available for the s10 platform including the plethora of suspension options both front and rear. This swap is so popular that there are a number of companies selling conversions kits to make it as painless as possible. Another option,one that doesn’t involve binning the factory frame, is using a front clip paired with a custom back half. For front clip options the two main schools of thought seem to be Mustang II or Camaro. Again swapping in either allows one to take advantage of the several aftermarket options available for both. I was torn between which option to take and at the onset of this project Jeff has been one of a few sounding boards for my thoughts. During one of my 1000 question sessions Jeff strongly urged me not to go s10 or Mustang II preferring the G body front end for its wider track and altogher dismissing the s10 chassis for this application. 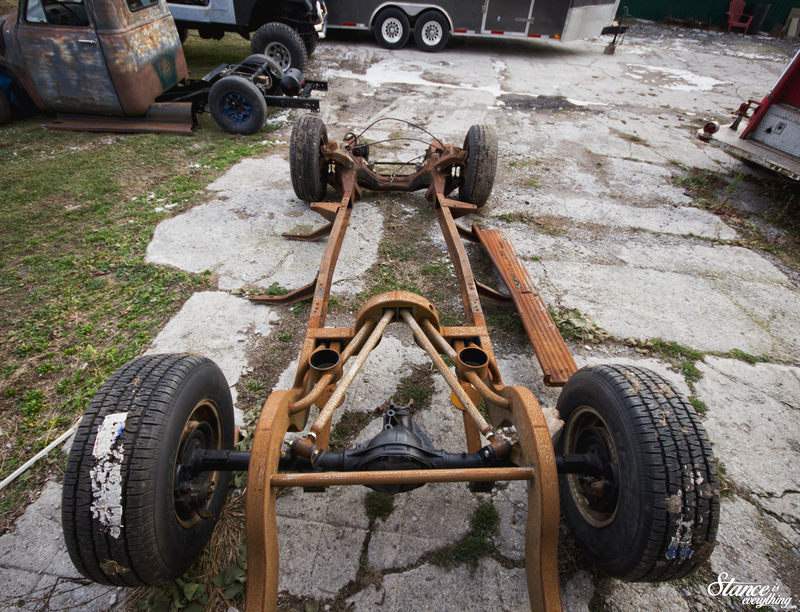 He also let it slip that the chassis he was building for his own project truck might be for sale. After some back and forth we both agreed that if his chassis was to go to anyone it should be me, fast forward a few months and what was his is now mine. The build of the chassis up to this point is very well documented here and as stated previously, is an Advanced Design at its core. The front end is G-body (Cutlass to be specific), the spring pockets have been cut out for RE7 bags, and the control arms have been de-humped and plated. Said front end has been boxed and blended into the factory AD chassis. The back half is a one-off laser cut triangulated four link that features a unique cross member to which the link bars are creatively mounted, during the process the truck was shortened to a short box. 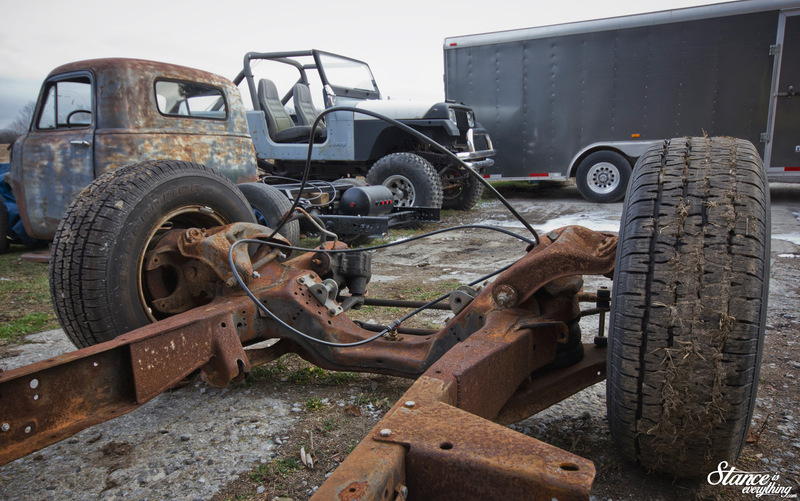 The suspension has geometry has been measured out to work best low and it will lay running board on a 30″ tall wheel/tire. 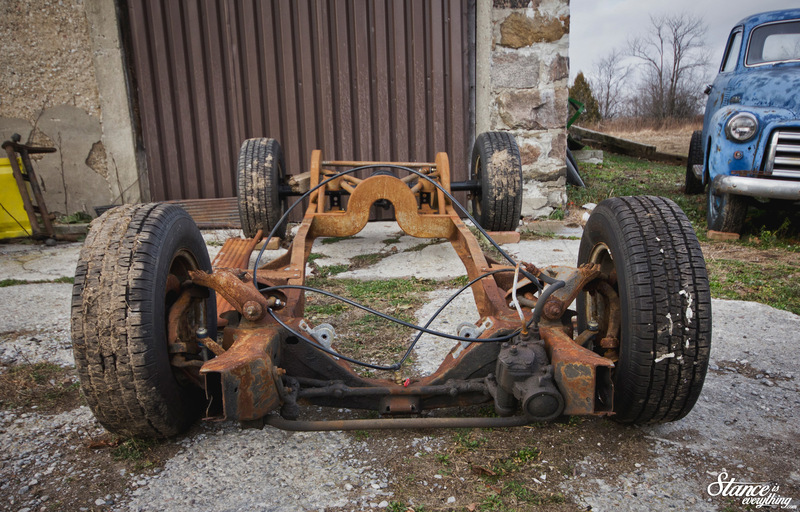 The chassis has also come with a LSD equipped F body rear end, an unmounted transmission cross member, four RE7 bags, small block motor mounts and a few other odds and sods that made it impossible to pass up. Those of you who were eager to see some fabrication during this build don’t worry, the chassis isn’t 100% complete at this point and it needs a few things here and there before it takes a trip to the sand blaster and paint booth. This is just a really, really, phenomenal place to begin and I’ll be making the most of it starting in 2016 as soon as another project gets a little further along. But that is a post for another day…. I see you bought stock in RUST-CURE. Seriously though, I anxiously await updates on the build. @Dorian B Yeah the frame was sitting for about a year before I got it. Then sitting a few months now haha. Looked great polishd but ain’t nobody got time for that! @Matt Campbell, lots of purchases, a bed is on route then I have enough to get going before I choose a power plant. I’m glad people seem so interested! You’re moving along quite quickly with this build. I can’t wait for more updates. Looking great, Dave! Always look forward to progress pics… ’til then, man…….